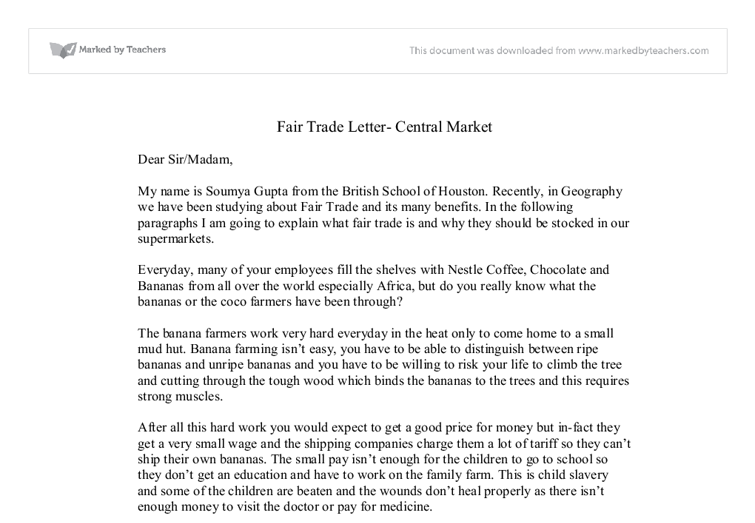 Fair Trade Letter- Central Market Dear Sir/Madam, My name is Soumya Gupta from the British School of Houston. Recently, in Geography we have been studying about Fair Trade and its many benefits. 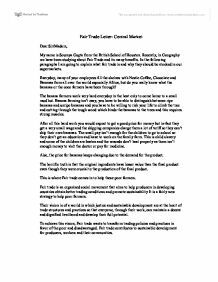 In the following paragraphs I am going to explain what fair trade is and why they should be stocked in our supermarkets. Everyday, many of your employees fill the shelves with Nestle Coffee, Chocolate and Bananas from all over the world especially Africa, but do you really know what the bananas or the coco farmers have been through? The banana farmers work very hard everyday in the heat only to come home to a small mud hut. Banana farming isn't easy, you have to be able to distinguish between ripe bananas and unripe bananas and you have to be willing to risk your life to climb the tree and cutting through the tough wood which binds the bananas to the trees and this requires strong muscles. ...read more. If every village keeps developing like this the country eventually develops. For a product to be classified as fair trade, it needs to be fair trade certified. This means that the crops must be grown and harvested in accordance with the international Fair trade standards. This is a sustainable form of development as the farmers keep getting a fair price for their product and the company keeps buying the products. This can be a never ending process and it helps the country develop because of the extra money for social products. But one of the main problems with fair trade is that many people haven't heard about it in many countries including United States. But in other places like The United Kingdom where people are aware of what it is, it has had a huge impact on the population and the people are willing to do more to help these poor farmers. The graph below shows how fair trade has grown in the UK. ...read more. These pesticides however are made from only natural ingredients meaning they are environmentally friendly and are harmless to people. This world map shows a few places which farm bananas (yellow) and cocoa (brown). Most of these countries as you can see are in South America and Africa because these places are generally less developed than the rest of the world. These places are usually less developed because of environmental factors like natural disasters and extreme temperatures. In addition, there are also human factors like colonization. But fair trade can help these countries develop one farmer at a time. So wouldn't you want to do your part in helping these farmers when they do so much for you? If it weren't for them you wouldn't be able to sell bananas or coffee or chocolate.Fair trade is a fast, easy and affordable way to help some of the LEDC countries develop. So please let us help these farmers by putting faire trade products in our supermarkets. King Regards, Soumya ...read more. This student written piece of work is one of many that can be found in our GCSE Human Geography section. Revision notes on International Trade. However this is not always the case. MEDC's may give money only if they spend it on their merchandise. the U.K as I think that even though the profit looks very good on paper if you use Far East factories there is also the question of Global Warming. All your products will carry thousands of air miles and add to global air pollution. To what extent does tourism in Majorca fit the Butler model?